The price of gas kept moving higher during the past week, according to the latest weekly survey from the U.S. Energy Information Administration. The weekly EIA report shows the price of an average gallon of unleaded gas in the U.S. is now at $3.51, up three cents from last week, extending the current spate of price increases to a fifth consecutive week. 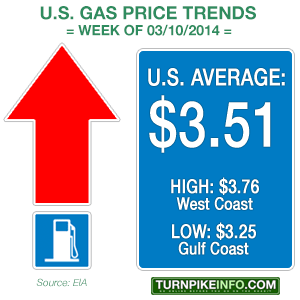 Of the ten weeks tracked so far in 2014, six have seen higher gas prices than the previous week. Overall, prices are up 21¢ per gallon, nationwide, during the past five weeks. That figure represents about $3.15 more at the pump, based on filling up a 15-gallon tank. On an annual basis, assuming a commuter is filling up twice per week, that comes to almost $328 more per year for gas. What is more, the price of gas is not likely to have stopped rising. Fear of increasing prices of of corn exports from an unstable Ukraine has added to the increase in gas prices, according to one analyst. Corn is refined into ethanol, which is blended into U.S. gasoline. The price of West Texas Intermediate crude oil has finally begun to fall, after a meteoric rise last week that saw the futures index push to near $105 per barrel for April delivery contracts. WTI was trading as low as $99.64 per barrel around mid-day Tuesday, but prices on the New York Mercantile Exchange had risen late in the trading session. Nonetheless, it was expected WTI would close below $100 for the first time in nearly a month. Part of the reason for the decline in prices was an increase in crude oil stocks in the past week, and inventories were expected to be up this week, as well. The weekly inventory reports are issued every Wednesday. However, the political and military crisis in Ukraine, which had combined with wild winter weather to push WTI and Brent Light Sweet Crude prices higher in the past few weeks, is still weighing on refineries. The reason is corn. Ukraine ships a large amount of corn to the United States, where it is refined into ethanol that is blended into fuels. Trilby Lundberg, who conducts the regular Lundberg gas survey each week, told CNBC the uncertainty in Ukraine had definitely become a factor in ethanol prices. However, she said the price increases that could be pinned on the Ukraine crisis would not continue affecting fuel prices in the United States unless the situation became markedly worse. Nonetheless, the upward pricing trend was not likely to end, primarily because the approaching change of seasons. The coming spring and summer driving seasons, replete with summer blends of gasoline coming out of refineries in the next few weeks, means that prices will continue rising, most likely through May, according to Lundberg. While short-term price hikes may be smaller than recent weeks, Lundberg predicts the onset of peak driving season will bring higher demand for more expensive fuels, which typically happens in the early and mid spring. Meanwhile, the cost of gas is still lower than at this time last year. The average price of a gallon of gas was about $3.71, measured nationally; and that was down $12¢ from 2012 prices. Even so, the EIA had predicted gas prices would decline through most of 2014, which has not manifest so far. Depending on what happens in Ukraine, Brent Crude could surge higher, dragging WTI with it, bringing a new round of heavy-handed price increases for drivers.